Love these chairs. Very well built. Great value! Extremely happy with our purchase. Vintage elements and contemporary livability come together to create a classic style that will look beautiful in any dining space. 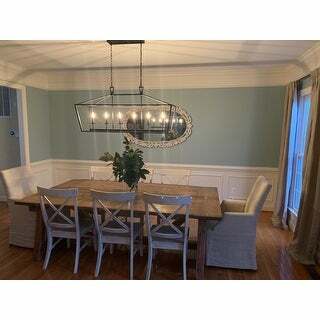 Authentic details like visible wood grain and a graceful X back add a sense of antique charm to this design. Available in several distressed finishes, including neutrals and bright hues. Assembly required. Product ships in One (1) box. 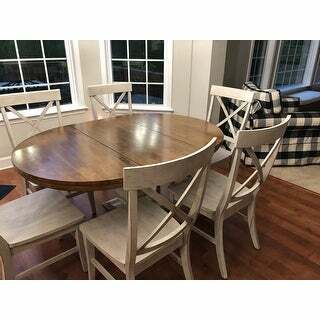 I purchased these chairs along with the Eleanor Sage Green Farmhouse Trestle Base X Base 5-Piece Dining Set. Since the back of these chairs are different, I placed these 2 chairs at the ends of my table. I really like how it looks with them being a little different than the rest of the chairs. Very pretty color, very sturdy furniture. Beautiful chairs! I have received compliments on them from several people. 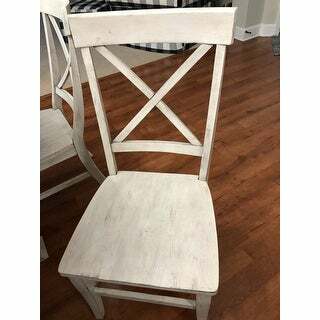 I bought the white distressed chairs to pair with the matching pedestal table I have in my kitchen. The finish and the x-back make the chairs quite charming. My husband assembled them in an afternoon. They are sturdy and level. The seats of them are quite generous too. I am impressed with this brand and plan to buy dining chairs by the same maker. These chairs were the perfect fit for my dining room table. They were easy to assemble and really sturdy, good quality. Loving the farmhouse look. I’m conflicted about these chairs. You get what you pay for - they were s little damaged when they showed up, but not worth the hassle of returning. They are also not a terribly sturdy chair. I don’t expect them to last for years, but they are fine for now. One of them was wobbly when assembled, but the price was right. "What is the height from the floor to the seat?" Seat dimensions: 17.9 inches wide x 17.1 inches deep x 16.9 inches high. Dimensions (overall): 19.6 inches wide x 20.9 inches deep x 39.1 inches high. 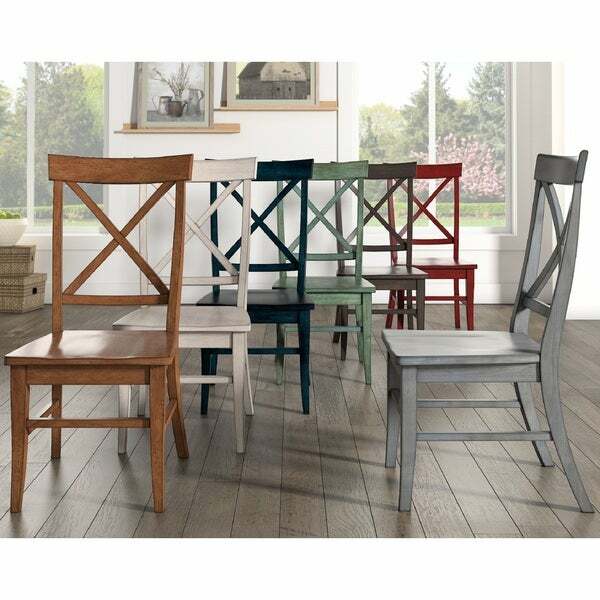 I chose these dining chairs because they are rustic and will enhance the farmhouse look in my dining room. I also love the color. "Is the antique black really a dark brown?" The black does not have a a dark brown color to it.